What is the TIMEVALUE Function? The TIMEVALUE Function is categorized under DATE/TIME functions. TIMEVALUE helps us convert a text representation of a time to MS ExcelExcel ResourcesLearn Excel online with 100's of free Excel tutorials, resources, guides, cheat sheets, and more! CFI's Excel resources are the best way to learn Excel on your own terms. These guides and articles teach spreadsheet formulas, shortcuts, and functions step-by-step with screenshots, templates, lessons, guides, and more time. In MS Excel, time is stored internally as a numerical value. It doesn’t recognize time in text value. Hence, the TIMEVALUE function allows us to convert the text representation of a time into a decimal that is recognizable as time. In financial analysisFinancial Analyst Job DescriptionSee a real Financial Analyst Job Description including all the skills, experience, and education required to be the successful candidate for the job. Perform financial forecasting, reporting, and operational metrics tracking, analyze financial data, create financial models, TIMEVALUE is useful when doing time calculations such as addition or subtraction and converting time imported from external sources in text form into a proper serial number of time. Time_text (required argument) – It is a text string that represents a time. In the text string, we need to separate the hours, minutes and seconds by colons. 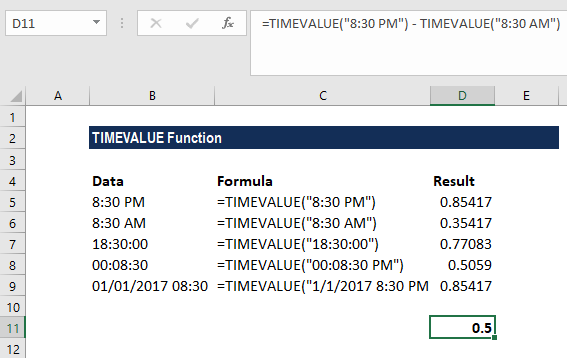 How to use the TIMEVALUE Function in Excel? As a worksheet function, the TIMEVALUE Function can be entered as part of a formula in a cell of a worksheet. Let’s see the results we get in various text representations. The TIMEVALUE Function is used to convert text representations of times into decimal values that can be understood as times in Excel. Cell A2 shows time in PM so the decimal returned for 8.30 pm, whereas in the next row, the decimal returned is for 8.30 am for the time in AM. The value in cell A6 is a date and time. In this case, the TIMEVALUE function ignored the date part of the value, and just used the time portion. As we know, times in Excel are regular decimal numbers formatted to look like times. And as they are numbers, we can add and subtract times just as with any other numerical values. Now we wish to put date and time in separate columns. For this, we can use the formulas =DATEVALUE(LEFT(B5,10)) and =TIMEVALUE(MID(B5,12,8)). To get the date, we extract the first 10 characters of the value with LEFT: so DATEVALUE(LEFT(B5,10)) will return the date as 03/01/17. The result is a text string. For Excel to interpret it as a date, we wrap LEFT in DATEVALUE, which converts the text into a proper Excel date value. For the time, we extract 8 characters from the middle of the value with MID: MID(B5,12,8), which returns “12:28:48.” The result is in text form, so we use TIMEVALUE to interpret and convert it into Excel time. TIMEVALUE was introduced in MS Excel 2000 and is available in all later versions. #VALUE! error – Occurs when any of the given arguments cannot be recognized as a valid Excel time.